There is actually a wild breed of canine called the New Guinea Singing Dog. It is highly predatory and will see anything that moves as prey. 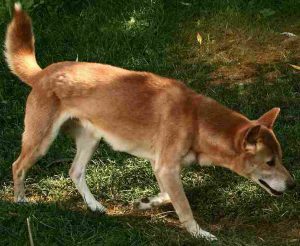 It is widely believed that the singing dog’s ancestry is the Australian dingo. These dogs made their way to New Guinea over a land bridge that existed more than 6,000 years ago between Australia and New Guinea. Others think that both the singing dog and the dingo owe their existence to an ancient extinct dog breed. While originally ranging over all of New Guinea, they now claim the upper mountains as their habitat. Singing dogs are excellent climbers and jumpers as their spines and joints are very flexible, similar to a cat. They are even able to climb trees. These dogs may not look frightening but they are wild. They have been classified at different times as domestic, feral or wild. Fossils of singing dogs have been dated back at least 6,000 years. 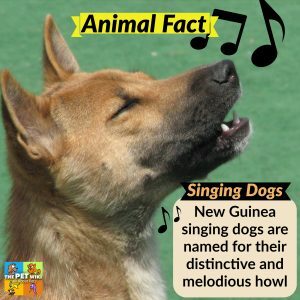 The singing dog has many names and is also known as the New Guinea Dingo, Hallstrom dog, Bush dingo, New Guinea wild dog and singer. In 1957, the Taronga Zoo in Australia imported the first pair of singing dogs to leave New Guinea. 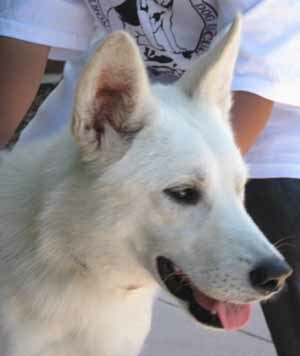 Their scientific name is Canis hallstromi, after the then president of the zoo, Sir Edward Hallstrom. Singing dogs can be seen in some zoos in the U.S. as well, such as the San Diego Zoo in California. Their diet consists of ground meat made for carnivores, dry and canned dog food, chicken breast, beef heart and twice weekly, rib bones. And yes, they do sing for their supper although it’s not required of them. Singing dogs look like dogs. 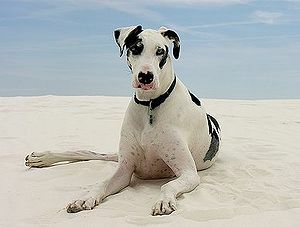 They have wide cheekbones, a narrow muzzle and erect ears. They stand 12-18 inches tall and weigh about 20-31 lbs. Eyes are almond-shaped and range in color from amber to dark brown. Their highly reflective eyes allow them the unusual canine trait of seeing more clearly in low light. 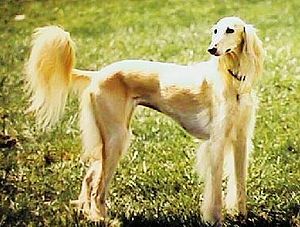 Tails are long, reaching to the hock and bushy with a white tip. The coat is dense and rough. Colors are brown, golden red or black and tan with white markings. Although wild, they don’t appear to be aggressive with humans. There have been no reports of bites to humans. Some New Guinea tribes have captured and trained them as an aid in hunting as well as pets for their children. The singing sound these dogs make communicate a range of emotions from happiness to sadness and everything in-between. A note on other dogs that “sing”. If your dog sings, it could relate back to his/her wolf heritage. Your dog may be imitating sounds it hears such as sirens or songs. Certain breeds such as Alaskan malamutes and Siberian Huskies will sing to greet their humans and to communicate while out on the sled. Years ago, I had a dachshund who would accompany me with singing when I played piano. More recently, my dear, late rottie mix, Timo, would get my attention by calling out in a sound that was a mix between singing and howling. We’d love to hear stories of your singing dogs too.